Rock Solid Recap: Nine Innings. No Complaints. The Rockies Outfield combined to go 7-for-13 with FIVE home runs, 11 RBI, 6 R, and 2 BB tonight. Carlos Gonzalez hit three of those home runs (two solos and a two-run shot). Not a one of them had a single bit of doubt, either, unless you factor in the welfare of the people or objects in the path of his destruction. You know how hot Dexter Fowler is right now? The baseball is exploding off his bat with nearly the same ferocity as Carlos Gonzalez's. Seriously. Of course I fully acknowledge that nobody hits the ball harder than Cargo when he's locked in (see above highlights), but Dexter is coming as close as anyone I can remember since CarGo arrived. And to complete the home run cycle — well, actually this came in the 1st, I'm out of order — Michael Cuddyer delivered the Grand Slam. Indeed the offense is answering the challenge right now. How long they can sustain a stretch this hot is now the question, and it's about to become more difficult if Troy Tulowitzki (strained left groin) needs a DL stint. The A-Team! Just too bad it took until May 28 for the plan to come together (or the manager to get it right). What Went Wrong: I'm just winging this tonight. There was no TV coverage here in Illinois. There's no chance in hell I'm going to go back and watch it later. And I'd be lying if I said I didn't turn off the audio after the 7th to focus on the 76ers-Celtics game. Turning Point: The Rockies scored one run on four hits in the 1st. Definitely could have and should have been more. One batter into the Reds half, their lead was already in jeopardy after Zack Cozart grounded to Jordan Pacheco at third. Pacheco's throw sailed past Helton, and the Reds instantly had a man in scoring position. Jeremy Guthrie did retire Drew Stubbs and Joey Votto without any advancement. But as we so often see with these Rockies, he couldn't finish the inning off. Brandon Phillips doubled Cozart home. Jay Bruce walked. Chris Denorfia (or Heisey, same thing) hits a three-run homer. The four runs were unearned by rule only. Guthrie absolutely deserves to be credited with all four of them because he all needed to do was make one more quality pitch to pick up his teammate and escape the inning. Couldn't do it. Instead, he let the inning (and ultimately the baseball game) get away with the double, walk and home run. Those were all on him. 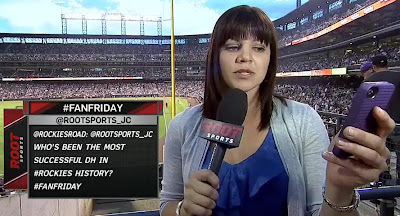 The Rockies streak of impressive play improved to 15 innings on Friday night. Their streak of not being outscored by the opponent now sits at two games. That means we get to pick a winning player! This is what Todd Helton does once or twice a month. He reminds us that an elite baseball player remains somewhere underneath his beaten up body, and when he's feeling good, he can win you a baseball game at any time all by himself. Granted, he had help on Friday from Troy Tulowitzki, Christian Friedrich and a damn solid bullpen, but it was Helton's two-run homer that set the tone, and his RBI single that provided the insurance. This one belongs to The Toddfather. Turning Point: The Rockies jumped up 3-0 early, then Cincinnati tied it at 3 in the 4th. It's at times like this that the Rockies have lost their focus this season. The quality of at-bats tend to decrease significantly. But that wasn't the case this time around. Rather, the Rockies continued pressuring Reds ace Johnny Cueto (who admittedly wasn't on his game), and quickly regained control of the game. Update: Michael Cuddyer was scratched from tonight's lineup with a stiff neck. He'll join Dexter Fowler on the bench (minor ankle thing). Annnnnd in case you missed it earlier in the week, Jonathan Herrera was placed on the DL with a hamstring issue. Infielder D.J. Lemahieu took his place. Troy Renck is also reporting that catcher Wil Nieves is in Cincinnati and listed on Jim Tracy's lineup card, meaning Ramon Hernandez will hit the DL with his hand injury. The Reds enter tonight's game with a six-game winning streak. Well, at least after the uninspired first three innings that left them trailing 3-0. 4th inning on, beautiful baseball. This was how Dan O'Dowd drew it up at 2-3-4 during the offseason. Then, before he knew it, his plans were changed when Jim Tracy moved Scutaro to the leadoff spot. Scutaro never got comfortable in that spot... or so it seemed, but appears to be settling back into the second spot nicely. Which of course means he'll be leading off all weekend in Cincinnati. Oops. Sorry. I'm trying to be positive tonight. No more cheap shots until Friday at the earliest. In addition to Scutaro's productive (3 runs) night, CarGo and Tulo were the offensive forces they're paid to be, each delivering the type of at-bats needed to be productive in the situation presented to them. For CarGo, that included setting the table (along with Scutaro) by drawing a walk ahead of Tulowitzki's RBI double in the 4th. Jason Giambi and Michael Cuddyer followed with equally productive sacrifice flies. In the 5th, Gonzalez singled home the tying with two outs. Troy Tulowitzki followed that by taking TWO pitches, working himself into a favorable 2-0 count, and then he connected on the game-deciding three-run home to deep left center. And then again in the 7th, Gonzalez hit an absolute missile off the center field wall for a two-out, RBI triple. I don't know what got into either guy tonight, but it was nice to see both reel themselves in a bit, slow the game down, and not allow the moment to overwhelm them as it has at many critical times this season. It's a positive step for both of them, and it's greatly appreciated by me. Tuesday's Recrap: Monfort Speaks, Rockies Lose. Again. Well, hey, at least Dexter Fowler isn't hitting eighth tonight! That's all I really have to offer today. I'm uninspired and have yard work to do before the 90 degree weather sets in over the weekend. What Went Wrong: Coming in to Sunday, Seattle's starter Blake Beavan had never struck out more than four batters in a big league start (23 career). He struck out seven Rockies. In just five innings. That's just one example of the crap that led to Colorado being swept for the third consecutive weekend (Braves, Dodgers, Mariners). Plenty more are on the way. Turning Point: This isn't so much a turning point. It's actually more along the lines of one of the most poorly executed defensive plays I've ever seen. It happened in the 1st inning with the game still scoreless. Seattle had men at the corners with two outs when Kyle Seager (runner on first) takes off for second hoping to draw a throw so his team can possibly steal a run. You've seen the play before a million times... especially if you or one of your children played youth baseball or softball. There it works pretty much all of the time. In the big leagues, you either eat the baseball or have something designed to counteract the play, usually resulting in an out. Heck, some teams even get a double play out of when they execute their plan. The Rockies? Well, let's just say they looked like they've never seen, heard of, or prepared for the above scenario, because as soon as Seager ran, all hell immediately broke loose. First it was Wilin Rosario's throw to second that sailed to the shortstop side of the base, almost as if he was expecting Troy Tulowitzki to take the throw. Nope, it was Marco Scutaro's play. After Scutaro lunged to make the catch, he came up firing wildly back to the plate... completely over the head of Rosario. Seattle's Dustin Ackley was credited with the steal of home. Seager was able to advance all the way to third and eventually scored on Justin Smoak's single. The power outage at the Townsend residence all morning and early afternoon was simply another reminder that the Rockies were playing this afternoon. Anyway, the power is back now. Maybe the Rockies can finally find theirs as well. Wilin Rosario with his third straight start? Well, maybe Jim Tracy DID get fed up with Ramon Hernandez after those two absurd at-bats in Thursday's loss to Arizona. If so, good on you, Jim. Update: Apparently the tendonitis in Ramon Hernandez's left hand has flared up again and is the reason Rosario has started all weekend. Thanks to @RockiesRoad for the heads up on that. In another bit of news this afternoon, Rex Brothers has been optioned to Triple-A Colorado Springs to work on a few things... as in everything. Adam Ottavino returns to take his roster spot. So hopefully you're a big Josh Outman fan, because the Rockies newest lefty is about to see increased work late in games. I'll let you decide if that was a horse racing reference or a reaction to today's Rockies game. What Went Wrong: I'll take the Gregg Popovich approach here. I'm not even annoyed with Friedrich for the first walk. His 3-2 pitch to Jesus Montero was right at the knees and caught the outside corner, but Paul Schrieber plain and simply squeezed him. Of course Kyle Seager's two-run homer followed that, and things predictably unraveled from there with three more walks and some pesky Mariners hitting that saw them using the entire field to their advantage. So yeah, this certainly was not an encouraging Coors Field debut for Friedrich, but I'm still confident his stuff is plenty good enough to succeed in Coors Field as long as the walks are limited. That's what killed him today. That's what kills everybody. Turning Point: I'll go with the 3-2 pitch to Montero that I mentioned above. Who knows, maybe if Schrieber rings Montero up there it changes Friedrich's outlook. It really was a perfect pitcher's pitch. To not get that call had to stick with him. Not that I'm making excuses for Friedrich, but there's undoubtedly a fine mental line that young pitchers walk in Coors Field. It doesn't take much to knock them off balance. Friday's Recrap: Owned by Kevin Millwood. That's pretty close to Rock Bottom. Today's big question: Does this lineup have more than two hits in it? I've going with yes. In fact, I'm predicting at least 15 hits because this will be one of those home games where the offense overcorrects itself after a brutal performance. You know, kinda like they did after Barry Zito shut them out and then they went nuts on Tim Lincecum. One of those deals. Rock Solid Recrap: Owned by Kevin Millwood. That's pretty close to Rock Bottom. What Went Wrong: Kevin Millwood shut the Rockies out on two hits. Turning Point: The Rockies first hit didn't come until two outs in the 6th. The game can't turn if one team's offense completely no-shows. Jim Tracy publicly pleaded with Alex White to come out firing strikes, to pitch with confidence, and to avoid the tentative style that has become common with Rockies pitchers. White responded to that challenge by pounding the strike zone, walking nobody, and delivering one of the more complete outings we've seen from any pitcher at Coors Field this season. It just wasn't as good as Kevin Millwood's. Anyway, White truly was Colorado's lone positive in this game. Hopefully the other pitchers on this staff take note. You can survive at Coors Field if you pitch effectively to contact. You simply cannot survive pitching anywhere if you fear contact. Screengrab of the Game: Congrats @RockiesRoad on having your question answered on the air! Who doesn't love Jenny's purple phone? What's Next: We're looking at some Saturday afternoon baseball tomorrow with a first pitch of 2:10 MT. Impressive rookie Christian Friedrich (1-0, 1.38) will make his Coors Field debut in that one for Colorado. He'll be opposed on the mound by Seattle's Jason Vargas (4-3, 3.28). And to avoid any confusion, this game WILL NOT be blacked out in Colorado or anywhere else. The Fox Sports broadcast begins tomorrow at 5:00 MT, meaning Root Sports will have rights to the broadcast. Final Thoughts: Busy days are ahead. I'm back on the Big League Stew beat as of Friday night with a handful of contributions coming each week. That won't necessarily change the volume of posts here at Heaven & Helton, but on certain nights it will change the timing a bit and perhaps the length of the content. I'll simply ask you for your patience with me when those nights occur. We'll be back to regularly scheduled baseball thoughts in this space tomorrow. I'd like to think Wilin Rosario is starting because of those two miserable at-bats Ramon Hernandez took yesterday, but it's not like Rosario's lone at-bat was much better. And beyond that, the two catchers have been playing every other day for about the last two weeks regardless of who's playing well, so this is just a continuation of that. Speaking of catchers, I'm going to predict John Jaso will be the random Mariner to kill the Rockies all weekend. I had a bad feeling we'd be in store for a miserable game this afternoon while writing last night's all positive recap. Sure enough, that bad feeling played out before my eyes. Well, at least until I stabbed them with a fork during the top of the 8th inning. What Went Wrong: I hope you have some time on your hands. Rockies pitching walked nine. Five of those came from starter Juan Nicasio, but only one of his scored. Josh Outman (1 walk) and Rex Brothers (2 walks), on the other hand, were not effective enough to overcome theirs, and while Matt Belisle's didn't score, it forced Jim Tracy's hand and made him use up Josh Roenicke for one batter to finish the 7th. That's worth nothing because had the game gone extra innings, Colorado would have been out of pitchers. I also didn't understand Jim Tracy's use of the double switch there since Roenicke didn't return for the 8th. He brought in Michael Cuddyer during that switch to replace Tyler Colvin in right, so I don't think he gained much of anything defensively (a better arm for less range). Of course this comes just two days after Tracy didn't use a double switch when he absolutely should have to avoid Josh Outman leading off an inning, so who knows what the hell kind of logic this guy is using. If any. PS: The Rockies also ran out of position players forcing Alex White to pinch-hit with the bases loaded in the 9th. Not that the double switch made a difference in that happening. Jim would have found another way to kill his bench I'm sure. In fact, I'm pretty sure Jim would have gone through the whole 40-man roster today if that was available. Anyway, back to the pitching. Walks are killer as we know. So are two-out runs. Today, the Diamondbacks scored all nine of their runs with two outs. And they all came in the final five innings. Also brutal? How about Ramon Hernandez's final two at-bats. In the 8th inning, Diamondbacks reliever David Hernandez had just walked Todd Helton and gone full with Jason Giambi (who singled to load the bases) when Ramon offered at the first pitch and popped out to shallow center. No advancement from the runners there. Arizona's Hernandez would walk two more in the inning helping Colorado tie it, while further driving home my frustration with Ramon's AB. Wednesday's Recap: Nine Innings. No Complaints. A Rockies baseball game took place tonight and I have nothing to complain about. Not a managerial decision. Not a mental lapse on the bases. Not a lack of hustle (though I could reach for a couple if I wanted). Not even a blown call by an umpire. The Rockies brought it in every phase of the game for nine complete innings. They never once made life easy for Arizona. Not even for one pitch or one batter, and they were rewarded with an easy 6-1 victory. It's all sounds so basic. Like something silly to get excited about. But the Rockies just don't play enough games like this. It's almost stunning when they do. They've been on the losing end of them repeatedly, but unless they're in the middle of some unconscious month long run to October, these only pop up occasionally. I'll certainly take it, though, and pull for many more just like it. I stated going in that it felt like Moyer needed a solid outing tonight to reestablish himself in the rotation. He responded like a guy that's been in this spot a time or ten in his 26-year career. He responded like a guy that really wants to stay where he is. He responded with a beauty. I think the line speaks for itself. But not only did Moyer need this, I think Jim Tracy really needed it. After last night's debacle, a night away from making stressful decisions was surely welcomed. The bullpen also obviously needed this with only Josh Roenicke (1 2/3 scoreless) and Esmil Rogers (perfect 9th) used to close it out. Credit to those guys because now the Rockies core relievers will be fresh for Thursday afternoon. Troy Tulowitzki is a go again tonight after looking awfully sore and limited last night. Meanwhile, Todd Helton gets his routine mid-week day off with Michael Cuddyer moving in to play first and Tyler Colvin sliding over to right. Also, Jordan Pacheco is safe. It's hard to believe the Diamondbacks are struggling almost as much as the Rockies. I haven't been watching them close enough to know exactly what their problems are — well, aside from missing Chris Young — but this appears to be a chance for the Rockies to string some wins together. Scutaro was out of the starting lineup tonight and didn't enter the game until an 8th inning double switch. That still left him plenty of time to play hero as his lead-off home run (first as a Rockie) in the 9th provided the difference in the game. Turning Point: Of course it wasn't an easy path to get to that moment. The Rockies led 4-1 in the 7th before Josh Outman and Matt Belisle worked together to allow San Francisco to tie the game. More on that debacle and where the blame ultimately lies a little later. When the bottom of the 8th rolled around, Jim Tracy continued to show confidence in Rex Brothers by throwing him into the fire. Naturally, four batters into the inning, the Giants had the bases loaded on three walks (one intentional). Everybody had a pretty good idea on how this would end, but Brothers actually flipped the script this time by overpowering and striking out both Brandon Belt and Melky Cabrera to escape the jam. If I'm Bob Apodaca, I'm calling Brothers into the video room first thing tomorrow to make him watch that entire inning pitch-for-pitch, and then repeatedly tell him how damn good he can be and how much easier his life will be if he attacks hitters and trusts himself. That message needs to become lodged in his head. Was hoping Guthrie would be more efficient and work a little deeper in his return, but looking back at how the outing unfolded, I'll certainly take this line. The Giants had plenty of opportunities to make it an even shorter outing, but Guthrie survived it by making a quality pitch every time he needed one. He even racked up a couple strikeouts in those spots and doubled his season high overall. Monday's Recrap: Lather. Rinse. Recrap. Colvin and Herrera hitting 1 & 2? Oh. Man. Jim Tracy is going to draw the ire of the statheads with that move. I think I'll just sit back and enjoy the show. Also, Carlos Torres is headed to Triple A to make room for Jeremy Guthrie. I'm sure just about every Rockies fan was waiting, hoping, praying, that name would be Esmil Rogers with the words "Designated for Assignment" directly following, but this move allows Torres to get back in the Colorado Springs rotation where he needs to be in case the Rockies need more rotation insurance down the road. Same exact script with a different starting pitcher and different final score. That, or click on the left where it says 2010 and 2011 Rock Solid Recaps and then click on any Rockies game in San Francisco. Seriously, we're 34 games into the season and we're already airing reruns from 2010 and 2011. Ugh. Turning Point: Again, like Saturday, the Rockies had opportunities to put crooked numbers on the board in the early innings because Giants starter Ryan Vogelsong was struggling mightily with his command (walked five in the first three innings). Unfortunately, Marco Scutaro was caught stealing and then Todd Helton struck out to end their 1st inning threat. Then in the 3rd, Michael Cuddyer flew out to the warning track with the bases loaded. 3 innings, 0 runs, 2 hits, 5 walks, 6 LOB. We were all interested to see how Christian Friedrich would follow up his outstanding big league debut in San Diego, but I don't honestly think too many anticipated him actually top that outing. But that's exactly what young Mr. Friedrich did on Monday night. Here's how it breaks down each time through the order. So Tyler Colvin has taken hold of the second spot in the order (for now). Jonathan Herrera, who had been hitting second in his starts, drops to eighth (for now). And it might be safe to say Wilin Rosario and Ramon Hernandez are in a 50/50 timeshare behind the plate (for now). Nooooot exactly the Giants we're used to seeing over the past three seasons. No Pablo Sandoval (DL). No Freddy Sanchez (DL). No Aubrey Huff. No Brandon Belt. And maybe most importantly, no Nate Schierholtz. Will all of those absences be enough to give Colorado a rare win in San Francisco? Does it even matter? We'll let you know in a few hours.